Global warming is a public health emergency. Substantial scientific evidence indicates an unequivocal rising trend in global surface temperature that has caused higher atmospheric levels of moisture retention leading to more frequent extreme weather conditions, shrinking ice volume, and gradually rising sea levels. The concomitant rise in the prevalence of allergic diseases is closely related to these environmental changes because warm and moist environments favour the proliferation of common allergens such as pollens, dust mites, molds, and fungi. Global warming also stresses ecosystems, further accelerating critical biodiversity loss. Excessive carbon dioxide, together with the warming of seawater, promotes ocean acidification and oxygen depletion. This results in a progressive decline of phytoplankton and fish growth that in turn promotes the formation of larger oceanic dead zones, disrupting the food chain and biodiversity. Poor environmental biodiversity and a reduction in the microbiome spectrum are risk factors for allergic diseases in human populations. While climate change and the existence of an allergy epidemic are closely linked according to robust international research, efforts to mitigate these have encountered strong resistance because of vested economic and political concerns in different countries. International collaboration to establish legally binding regulations should be mandatory for forest protection and energy saving. 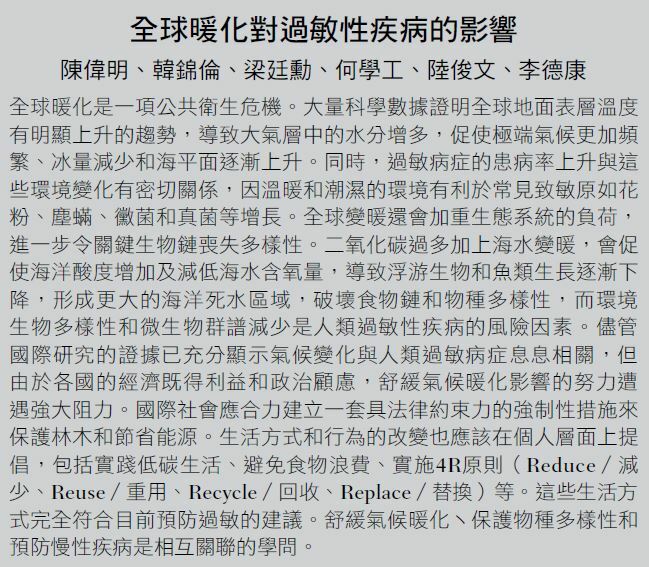 Lifestyle and behavioural changes should also be advocated at the individual level by focusing on low carbon living; avoiding food wastage; and implementing the 4Rs: reduce, reuse, recycle, and replace principles. These lifestyle measures are entirely consistent with the current recommendations for allergy prevention. Efforts to mitigate climate change, preserve biodiversity, and prevent chronic diseases are interdependent disciplines. Climate change will continue to accelerate for the next few decades unless substantial intervening efforts are enforced. It is projected that by the year 2100, there will be an increase in annual mean temperature by 3°C to 6°C and there will be significantly greater annual numbers of very hot days (ie, heat waves, defined as daily maximum temperature ≥33.0°C) [Fig 2]. Additionally, it is estimated to have a marked increase from 3 to 12 extremely wet years (ie, annual rainfall >3168 mm) during the 21st century. The annual mean sea level is predicted to rise by 0.63 to 1.07 metres, and severe storm surges may become an annual event whilst these have only occurred once every 50 years in the past century.27 Nonetheless these projections are likely to underestimate the actual consequences. For example, according to the World Meteorological Organization (WMO), anthropogenic greenhouse gas emissions for 2016 were even higher than those in 2015, increasing from 400.0 ppm to 403.3 ppm in 12 months. Although the rate of this increase appears to have slowed, the warming trend in the climate system will ensure the continued temperature rise long into the future, leading to progressive temperature rises of up to 5°C to 6°C and with large parts of the Earth potentially uninhabitable in a foreseeable future. Epidemiological studies have pointed to a close correlation between global warming, air pollution, and allergic diseases.33 The process of industrialisation, increasing vehicle emissions, and a westernised lifestyle are the major contributors to air pollution. Global warming contributes to air pollution by increasing the demands for space cooling, more natural formation of air pollutants (eg, wildfires, soil erosion, decomposition of organic substances such as plants and animals), and enhancing the urban heat island effect that causes the formation of secondary pollutants (such as ozone). Atmospheric pollutants such as nitric dioxide, ozone, and particulate matter are known to be strongly associated with allergic respiratory diseases. Warmer mean temperatures have been shown to be associated with a higher prevalence of asthma. In a New Zealand study, a rise in mean temperature of 1°C was associated with an increase in asthma prevalence by about 1%.41 In an Italian study that compared two regions with a Mediterranean climate and a subcontinental climate respectively, a higher mean temperature was also associated with an increased prevalence of asthmatic attacks.42 In contrast, the International Study of Asthma and Allergies in Childhood (ISAAC) did not find this same correlation between mean outdoor temperatures and the prevalence of asthma.43 Nonetheless the ISAAC study was not designed to specifically investigate the effect of temperature change in different subregions. There have been no studies that specifically focused on a link between urticaria and global warming per se, although a few anecdotal reports have observed that during high temperatures associated with global warming patients, tended to wear less clothing, leading to more light exposure that exacerbated their solar urticaria.62 As for eczema, there is no known correlation between mean outdoor temperature and its prevalence. One major challenge for climate change mitigation is the resistance against countering global warming. In an interview with CNBC, the US Environmental Protection Agency Administrator and also a climate change sceptic, Mr Scott Pruitt, stated that he did not believe carbon dioxide is a cause of global warming. He also described the Paris Agreement, where representatives from 190 countries agreed to work towards lowering carbon dioxide emissions, as a ‘bad deal’.72 More than 20 non-profit groups supported him and contributed more than US$88 million to spread climate science disinformation via think tanks and advocacy groups to support contrarian ‘science’ intended to create doubt about the prevailing science of anthropogenic climate change, mostly from fossil fuel interest groups, following the example of the Big Tobacco’s efforts to derail anti-tobacco legislation. Despite this, a large body of scientific evidence shows that fossil fuel burning is the main cause of climate change. The use of renewable energy such as solar, wind, ocean, biomass, geothermal resources for electricity and heat generation to replace conventional fossil fuel combustion is an important strategy. Reforestation, afforestation, and avoidance of desertification require multinational and well-coordinated efforts. For example, China is shifting from fossil fuel to renewable energy with related investments rising from US$3 billion in 2005 to US$127 billion in 2017, more than the US and EU combined.73 Another example is India’s Forest Rights Act that aims to strike a balance between agriculture, urbanisation, and forest protection via legal reinforcement. This act protects the grassland and national parks from unauthorised agricultural activities and ensures livestock are fed in designated areas, and places a ban via legal measures on unauthorised deforestation.74 The inter-governmental panel on climate change established by the United Nations Environment Programme and the WMO is currently the international scientific collaborative network focusing on a multinational approach to climate change mitigation. Efficient energy use is critical to reduce the energy consumption. New techniques in home insulation are available that can help reduce space heating and cooling requirements while maintaining a comfortable indoor temperature without additional energy consumption. Lighting using light-emitting diodes or compact fluorescent lights consume less than a quarter of the energy and are much longer-lasting than traditional incandescent light bulbs. In addition, the use of skylights reduces the energy required to attain the same level of illumination and they are now more commonly incorporated in architectural designs. Lifestyle and behavioural changes remain the most important strategies at an individual level. Educational and incentive programmes should be provided for public stakeholders for environmental protection. As the prevalence of allergic diseases is correlated with global warming, a better mitigation of important climatic changes will help to alleviate the progressive increasing trend of allergic disease development. Global warming is caused by human activities. A paradigm shift should take place to enable everyone to live a healthy and environmentally friendly lifestyle. Allergy prevention and biodiversity preservation should not be practised at an individual level only, as it is a true global health emergency. Strategies must continue to be planned and coordinated at an international level. Measures to mitigate global warming, preserve biodiversity, and prevent allergic diseases are interdependent disciplines that will need to continue to be a major advocacy and research focus in the next century and beyond. As an editor of this journal, KL Hon was not involved in the peer review process of this article. All other authors have no conflicts of interest to disclose. All authors had full access to the data, contributed to the study, approved the final version for publication, and take responsibility for its accuracy and integrity. 1. World Health Organization. Climate change and health. Available from: http://www.who.int/mediacentre/factsheets/fs266/en/. Accessed 27 Sep 2017. 10. Alley RB, Brigham-Grette J, Miller GH, et al. Past Climate Variability and Change in the Arctic and at High Latitudes. Washington: US Climate Change Science Program; 2009. 26. Hong Kong Observatory. Record-breaking high temperature [press release]. Available from: http://www.hko.gov.hk/press/SP/pre20150808.htm. Accessed 16 May 2018. 27. Hong Kong Observatory. 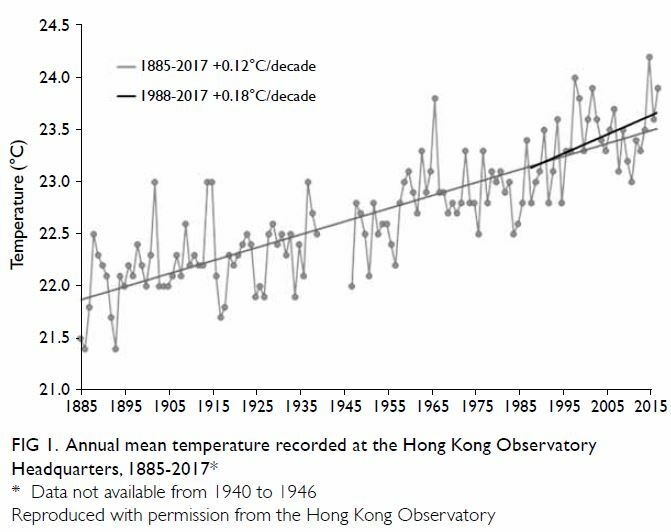 Hong Kong in a warming world. 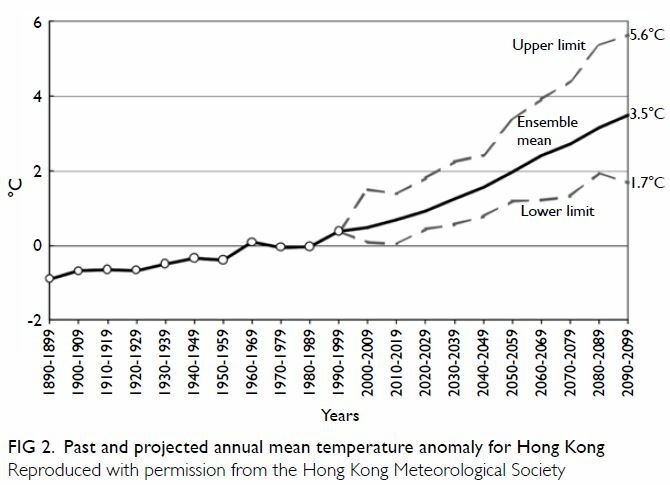 Available from: http://www.hko.gov.hk/climate_change/climate_change_e.pdf. Accessed 16 May 2018. 32. Pawankar R, Holgate ST, Canonica GW, Lockey RF, Blaiss MS, editors. WAO White Book on Allergy: Update 2013. Milwaukee [WI], US: World Allergy Organization; 2013. 33. Fifth Assessment Report of the Intergovernmental Panel on Climate Change. Climate Change 2013: The Physical Science Basis; Summary for Policymakers. Intergovernmental Panel on Climate Change; 2013. 37. Meng Z, Lu B. Dust events as a risk factor for daily hospitalization for respiratory and cardiovascular diseases in Minqin, China. Atmos Environ 2007;41:7048-58. 40. Potter PC, Motala C, Fenemore B, et al. Sensitisation to three cockroach species in Southern Africa. Curr Allergy Clin Immunol 2005;18:62-6. 56. World Health Organization. Health aspects of air pollution with particulate matter, ozone and nitrogen dioxide. 2003. Available from: http://www.euro.who.int/__data/assets/pdf_file/0005/112199/E79097.pdf. Accessed 6 Feb 2018. 65. Convention on Biological Diversity. Global Biodiversity Outlook 4: A Mid-term Assessment of Progress towards the Implementation of the Strategic Plan for Biodiversity 2011-2020. Montréal, Canada: Secretariat of the Convention on Biological Diversity; 2014. 72. DiChristopher T. EPA chief Scott Pruitt says carbon dioxide is not a primary contributor to global warming. CNBC Politics news. Available from: https://www.cnbc.com/2017/03/09/epa-chief-scott-pruitt.html. Accessed 30 Jan 2018. 73. Frankfurt School-UNEP Centre/BNEF. Global Trends in Renewable Energy Investment 2018. Frankfurt School of Finance & Management gGmbH; 2018.